When Instagram announced that it would be opening its’ ad platform to all brands in October 2015, many companies jumped at the chance to connect with this younger demographic on the visual centric platform. Soon after Instagram’s announcement, we ran two initial tests for two brands in vastly different industries – healthcare & psychic readings. From our campaigns, we were able to engage with a total of 1,320 people at a minimal investment. In this post, I’ll share details of the tests including insights on ad copy, formatting, reach & frequency, as well as future testing opportunities to help you successfully advertise on Instagram. If you’re looking for details on how to create an Instagram ad, I’d recommended reading this detailed how-to article by Ross Simmonds. Once you’re ready to make an ad – read below to learn how to best optimize your campaign. When first building an Instagram campaign, it’s crucial that you establish the goals before running the ads on the platform. 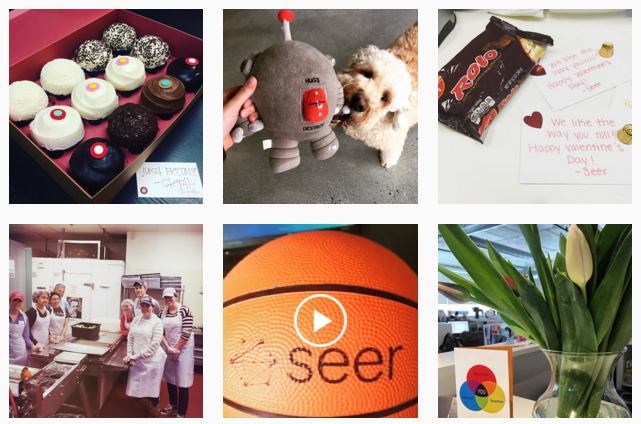 Below are examples of how the Seer PPC team established goals for two client Instagram campaigns. Einstein Healthcare, a hospital network in PA, strives to be a digital leader in the healthcare space and to break away from the “cookie-cutter” feel that most of their competitors have. They strongly believe in the mission of providing healthcare with compassion. 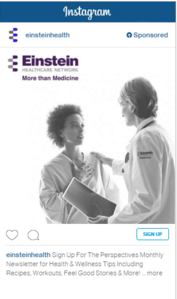 As Instagram engages users with emotional & strong visuals, testing Einstein’s More than Medicine ads on this social platform was a no brainer. Our main goal of this campaign was to expose Instagram users to Einstein’s More Than Medicine movement to ultimately increase brand awareness, while the second goal was to drive email sign-ups for their monthly newsletter. We used 4 different types of interest targeting: dieting, nutrition, physical fitness and running (all of which are common themes in Einstien’s newsletter). 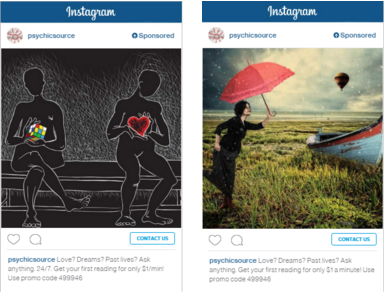 Psychic Source, a live psychic call center, was also interested in testing out Instagram ads. Psychic Source’s mission is to connect customers with psychics who can provide meaningful, authentic psychic readings. To use Psychic Sources’ services, users must pick up the phone and call. The majority of users look at Instagram on their mobile device. With this mind, we created ads for Psychic Sources’ in which a user could easily click to call in seconds. In addition, the brand already had a strong social media presence on Facebook so by expanding to Instagram, we were able to increase the number of times our ads could appear in front of a user. For the Einstein Healthcare campaign, we saw very low impression frequency, with our highest ad set having a 1.11. This means the average user saw our ad 1.11 times which will most likely lead to low brand recall or awareness for that user. Psychic Source had an impression frequency of 1.64 and 3.08 for each of its two ad sets, neither of which are notably high either. While we do not want to “over-saturate” our audience with our ads, we would like to see a bit of a higher frequency to increase brand recall and our chances of a user interacting with the ad. However, one positive aspect of a low frequency rate is that Einstein had a lot of unique “people taking action,” which Facebook identifies as when one person takes an action, such as leaving a comment or downloading an app, as a result of the ad. (Source: Facebook). Facebook/Instagram sets a frequency cap for new ads and campaigns to ensure proper user experience. There also may be differences between verticals. Healthcare is a need and isn’t necessarily something users look for on social mediums. Research of the industry shows that users need healthcare but typically don’t want to deal with it. Where as, Psychic Source offers users a service that they actively search for. This is going to have an effect on user intent; Facebook & Instagram could have inside data on this and adjust ads accordingly. For your own Instagram campaign, if you are trying to increase brand awareness and recall, starting small may be the way to go. Psychic Source received its highest frequency from the ad set with the smallest reach (between both clients). Also, have more than one ad iteration ready to go. The fact that Psychic Source had two ad iterations where Einstein only had one could also be the reason for higher frequency in the one ad set. An ad on Instagram, along with ads on many social platforms, is clearly marked as such (“Sponsored” appears in the top right corner). Instagram users favor ads that look less like an ad and more like an organic photo. This is especially true since ads on Instagram are very intrusive and take up a majority of the space on a mobile screen. In a study by Sprout Social, open backgrounds, a solid color background, and photos with high quality texture receive more interaction that posts with less background space, multiple color tints, and lower quality images. (Source: Sprout Social). The Einstein ad has a plain white background, with the brand logo in the top left and a doctor helping a patient. This image is clearly an ad, but since our primary goal is brand awareness, this is not an issue. If we were to focus more on the email signups goal, or even appointment requests, we would recommend that Einstein develops an image that appears more organic, such as a picture that a patient or family member might post from their own accounts. The images used by Psychic Source are not “branded” at all, expect that the brand name appears above the image, next to the “Sponsored” label. Instead, the ads appear to be artsy pictures that someone found and shared from their own account. As the ads blend in with the typical user-generated content one sees on their Instagram feed, it will not immediately turn an “ad hater” away. This fact can be supported by the .97% CTR Psychic Source had as opposed to the .71% CTR for Einstein. When building Instagram ads for your brand, create ads that match the high-quality style of images already shared frequently on Instagram to entice users to interact with your campaign. One of the greatest aspects of advertising on social media is the demographic targeting and insights you can gain. Instagram is no different. Be sure to review your demographic data after your campaign has been running to make the appropriate adjustments. Below is the gender data from the Einstein campaign. Moving forward, we plan to create ad sets broken out for future tests between men and women so that we can adjust our ad image and copy to the preferences of that audience. 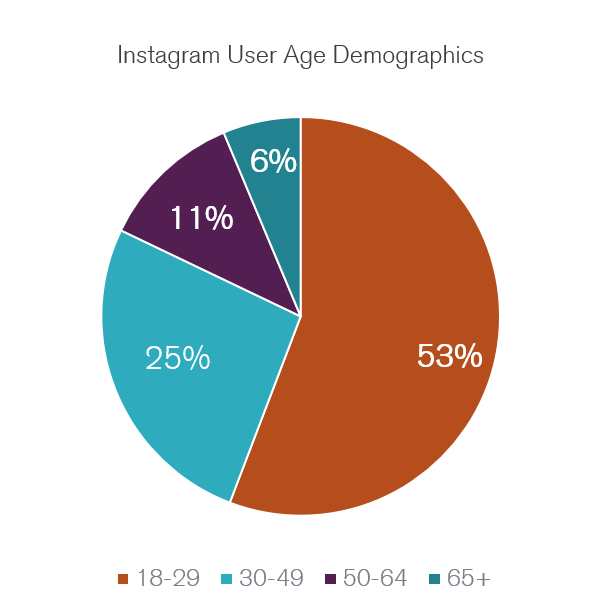 When creating your own ads on Instagram, revisit the demographic data from the campaign to find new iterations for unique audiences. It’s very important to format your targeting so that each ad set has a unique audience. For example, we had two individual ad sets for both clients. This way, we could easily compare. With the Einstein campaign, we could compare the success of physical fitness vs. nutrition, and for Psychic Source, we could compare data from CA Psychics vs. General Psychics. When creating ad sets, try to make them close in size. If one ad set has a significantly higher reach, comparing numbers could be skewed. If this is unavoidable, try to use ratios such as CTR and CVR as your basis for comparison as opposed to sheer volume. This will show an audience’s likelihood to click and/or convert, regardless of the amount of users you reach. The message you are trying to share, especially your call to action, should be very clear and direct. Instagram allows your ad to have 300 characters but your message will be truncated after 130. Einstein’s message includes the “more” option, however the main gist of the message is completely visible without clicking “more.” Psychic Source’s entire ad copy is visible. Make sure that your call-to-action is clear and to the point, so when your ad appears in a user’s feed, they quickly understand the gist of your brand’s message. We were not able to test this with either of Seer’s clients but this is definitely something we recommend testing in the future. As digital marketers know, retargeting is a great way to re-engage with users that either did not take the action we would like them to, or to promote some form of cross-selling. For Einstein Healthcare, we are currently building two audiences from the Instagram campaign: an audience that landed on our website and landing pages but did not sign up for the email newsletter and an audience that did sign up for the newsletter (hoping to build a similar audience). After running your Instagram ads, review your audience and re-target to them based on the goals your marketing team has moving forward to get the most out of your Instagram campaign. Facebook allows you to integrate your campaigns together simply by adding Instagram as a placement. We highly recommend that marketers do not do this. Facebook and Instagram have different user experiences. So even if the same targeting is used, Instagram should be separated out from Facebook allowing for easier reporting and tracking. Check out this post on how to use paid social to improve your conversion funnel. Huge shout out to my colleagues Joe Levinthal and Lauren Miller for helping with the data and management of these campaigns.